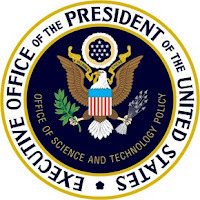 President's Council of Advisors on Science and Technology (PCAST)on December 8, 2010 released their report to the President: "Realizing the Full Potential of Health Information Technology to Improve Healthcare for Americans: The Path Forward." In this post I am going to focus on Chapter 4 of the PCAST Report on health IT "Technology for an Integrated Health IT Ecosystem." The chapter's text is below. Since according to Dr. David Blumenthal, the National Coordinator for Health IT, the President strongly supports the approach of the PCAST report, there will certainly be ramifications for future stage meaningful use requirements regarding health information exchange. "We are going to move forward with a great deal of aggressiveness on health information exchange and interoperability, and even faster than we had expected based on the council’s report," he said. "Ultimately, when we are setting standards for the second stage of meaningful use, we’re going to be relying on this committee." ONC will create a new advisory panel to evaluate strategies for implementing recommendations from the PCAST report. The panel will include members of the Health IT Policy and Standards committees, as well as other privacy and security experts. The panel will make recommendations to the Policy and Standards committees in April. Then the Standards Committee will evaluate the proposals for a universal health data exchange language. Blumenthal said the Standards Committee will be tasked with selecting a proposal that is "technically as refined and as open to innovation, but as reliable, as we can make it." Keith Boone, the Standards Geek for GE Healthcare, gives an excellent critique of the PCAST report. He makes the point that "we need to figure out how to take the work that has already been done and use it to guide it towards the behaviors we want to see: use of the healthcare language. 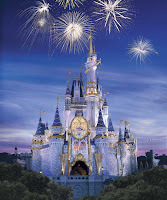 That evolution will enable the revolution that PCAST is looking for." Much of the groundwork for this language has been laid by Health Level Seven (HL7)Joseph Conn, from Modern Healthcare magazine, spoke with Gary Dickinson, co-chairman of the electronic health-record work group of HL7. "We’ve spent a lot of time in this very area, and this seems to be moving in the direction we’ve been espousing for a long time," Dickinson said. "To put it into everyday, ordinary language, 'meta data' is a way of describing actual data, the things we use in healthcare, and tagging is a way to have a generalized exchange mechanism, such as a generalized container, where the container is used universally and the content will change," he said. "The container would allow you to capture that summary record inside, and in that container you'd have a diagnostic code, some patient identification information, the symptoms reported by the patient and the particular things that were observed during that encounter, such as vital signs, and orders to the lab and a follow up with a specialist." The best explanation of the PCAST report I've seen comes from Dr. John Halamka, who both worked on the report and sits on the HIT Standards Committee. Dr. Halamka believes that the PCAST report is consistent with the work done to date and that the foundation created by Meaningful Use Stage 1 puts us on the right trajectory to embrace the spirit of PCAST. I agree that the report builds on the work of the ONC, and while it does give some impetus for new emphasis on health information exchange, it does not radically alter the current trajectory. The current health IT landscape is dominated by enterprise systems based on proprietary formats. These systems lack ability to communicate and aggregate health information in the ways needed to serve patients, doctors, and researchers. The systems have been designed primarily to enable point-to point communication of administrative information rather than clinical data. Importantly, the nature of current systems makes it difficult for innovators to develop new tools to improve the use of health information. There are few policies or governance models to drive innovations, such as research, advanced clinical decision support, or benchmarking. In short, there is no fuel for an ecosystem of economically selfsustaining healthcare innovation. The overarching goal is to have a national health IT ecosystem in which every consumer, doctor, researcher, and institution has appropriate access to the information they need, and in which these groups are served by a vibrant market of innovators. At the end of the previous chapter, we listed a set of technical and market-related requirements for enabling this overarching goal. Here, we look at several possible technological approaches and describe in some detail an approach that, we think, has the greatest likelihood of rapid forward progress. Over the last 20 years or so, an era dominated by vertically integrated, proprietary EHRs, one approach has been to seek to create standardized health records. Because the medical system has long relied on filling in paper records, it was natural to assume that exchange or reuse of data would be impossible without establishing standardized record formats that would be comparable across providers. However, we believe that any attempt to create a national health IT ecosystem based on standardized record formats is doomed to failure. First, there is too much diversity and incompatibility for any kind of a priori standard to emerge. With so many vested interests behind each historical system of recording health data, achieving a natural consolidation around one record format for any particular subset of data would be difficult, if not impossible. Second, systems based on fixed records are inherently limited in their functionality. Consider, for example, a health record in which all types of blood test information are always stored. When a new type of blood test is developed, it is difficult to expand the record to include it. Moreover, it is difficult to exchange only parts of such an electronic record according to a patient’s choice (for example, blood glucose measures but not HIV status). A second approach to health IT, spurred by the emergence of the Internet, has focused on serviceoriented architecture (SOA) as a way to solve the problems inherent in standardized record formats. SOA essentially involves using software policies, practices, and frameworks to enable one user to access sets of “services” on another party’s computers and data.43 For example, two hospitals, using two different systems, might create bilateral arrangements that enable them to run “services” on each other’s systems to execute transactions or access data. The approach could be expanded to small networks, and even to networks of networks. There have been extensive efforts to implement the above approaches in local and regional HIEs that seek to connect multiple organizations. By 2009, there were more than 190 HIE initiatives in the United States—although only about one-third were fully operational.44 These HIEs report lower costs, improved outcomes, reduced staff time spent on process-oriented work, and increased data exchange—demonstrating the benefit of health information exchange. But despite these benefits, these approaches fall far short of what is needed. Most HIEs are based on standardized record formats or integrated care systems that cannot readily scale. Others link a range of proprietary systems. If a patient moves between two hospitals even within an HIE, critical tests done at the first hospital must often be repeated. Most HIEs face the administrative burden of requiring adoption of legal agreements at each provider organization to share data. In addition, HIEs that began as pilot projects do not appear to be spreading or scaling up beyond their initial scope because they were launched without significant attention to long-term business models, a problem that the meaningful use incentives may not overcome. Most HIEs, moreover, are not currently interoperable across regions and markets to other HIEs, and thus remained closed and proprietary even as patients seek and require care outside their confines.45 Because each HIE system is different, there is little incentive for entrepreneurs who make middleware and other innovative tools to serve this marketplace. While such systems can surely be incrementally improved, we believe that such approaches will not solve the fundamental need for data to be universally accessed, integrated, and understood while also being protected. In a sector as fragmented and rapidly evolving as healthcare, we believe it is impossible to build a national implementation of SOA solutions and directories that could be used and scaled indefinitely into the future. (To draw a loose analogy, the approach is like trying to enable free trade among hundreds of entities by negotiating a huge number of bilateral trade agreements. Or it is like trying to promote dialog among speakers of a thousand different languages by training one million translators, each knowing a pair of tongues, instead of enabling them to speak a common language. The idea is laudable but impractical.) Moreover, the approaches will not overcome the barriers to entry for innovators wishing to develop new solutions. We believe that a steady supply of such innovators in the ecosystem is essential for increasing quality and decreasing cost. The best way to achieve a national health IT ecosystem is to ensure that all electronic health systems can exchange data in a universal exchange language. The systems themselves could be designed in any manner desired — they could accommodate legacy systems that prevail or new recordkeeping systems and formats. The only requirement would be that the systems be able to send and receive data in the universal exchange language. We believe that the natural syntax for such a universal exchange language will be some kind of extensible markup language (an XML variant, for example) capable of exchanging data from an unspecified number of (not necessarily harmonized) semantic realms. Such languages are structured as individual data elements, together with metadata that provide an annotation for each data element. With some risk of oversimplifying, let us give an example. Imagine that an elderly patient has lived in several different cities and, over the years, has had mammograms done at various hospitals and clinics. Her physician now needs to retrieve images of her breast tissue over the previous decades to determine whether a current lump is of concern. In a health IT ecosystem where tagged data elements make up a universal language, the data elements the doctor could retrieve about this patient would include the mammograms themselves from all of the various places the patient has sought treatment regardless of provider network, geographic location, or whether the patient remembers them. The physician would be able to securely search for, retrieve, and display these privacy-protected data elements in much the way that web surfers retrieve results from a search engine when they type in a simple query. What enables this result is the metadata attached to each of these data elements (mammograms), which would include (i) enough identifying information about the patient to allow the data to be located (not necessarily a universal patient identifier), (ii) privacy protection information—who may access the mammograms, either identified or de-identified, and for what purposes, (iii) the provenance of the data—the date, time, type of equipment used, personnel (physician, nurse, or technician), and so forth. Most of the time, the metadata will not be needed by the physician; this information will be invisibly in the background. Occasionally, as in the case of a false positive or false negative in a particular image, the physician may want to dig deeper: The metadata will be there. The metadata will also be important for researchers who may have access only to de-identified data. They might use it, for example, to determine whether a certain type of imaging equipment for breast cancer is yielding excessive numbers of wrong diagnoses. In the example above about retrieving multiple mammograms, we assumed more than simply a universal exchange language. We also assumed the existence of certain national infrastructure for finding health data, and for controlling access to it. (Importantly, though, we have not assumed a national repository for storing health data, which would be a more difficult and politically problematic issue.) We call this infrastructure, collectively, data-element access services. The services would include those associated with crawling, indexing, security, identity, authentication, authorization, and privacy. As proposed, these DEAS and their components would have no right to use the data being exchanged; in fact, they would probably not even see the data. Rather, they would act much like today’s web search engines, but with additional levels of responsibility for exposing only those data elements authorized by applicable privacy rules and policies (including a patient’s persistent privacy choices) and only to authorized, authenticated users. A patient would have the right to restrict the types of data elements indexed at all, or could opt out of the DEAS completely (although such a choice might negatively impact that patient’s future care). We discuss privacy protection and security in more detail in Chapter Five. Today, when a user views a web page, the data that make up the various parts of the page (text, images, ads, audio, video, etc.) are dynamically aggregated in real time from numerous computers in a range of physical locations and are then presented to the user as a single logical entity: the web page being viewed. The individual elements are not routed through any central server or repository. Rather, a set of access services enables the browser to query many distant computers simultaneously. Similarly, for health IT, a query submitted to the data-element access services would result in the seamless, dynamic aggregation of all the data requested. For example, a doctor’s request for patient information could involve an indexing system identifying all the physical locations on the network of the data; real-time aggregation of the data; and analysis, translation, and presentation by the software application that the doctor is using. The health IT ecosystem we envision does not require the existence of a uniform patient identifier. Instead, it could use associations of intrinsic patient-related information to link the appropriate data to specific patients. This method is used now to create patient record locators within local closed systems and regional health exchanges, but as employed today, it can be plagued by human error. Since an automated system can use many more than the two factors (such as name and birthdate) now often used, it can be correspondingly more accurate. Indeed, “identity resolution” is an established technology, with commercial offerings available. For greater accuracy and convenience in the record-keeping associations, some patients (e.g., those named “John Smith”) might elect to index their records by an email address or a reference to a personal health record account, but this would be optional. How should DEAS be brought into existence and operated? There are several viable options: Individual states (or self-formed groups of states) could establish and operate DEAS. Federal funds might be used in the manner of a “race to the top,” to support the best state’s proposals, or to create an additional interoperating and intercommunicating DEAS for use by Medicare providers. DEAS could be established in large health delivery networks (including those operated by the Federal Government, such as the Veterans Administration). They could emerge from a more aggressive push toward achieving interoperability among existing HIEs. Or, their growth could be left to the private sector, perhaps seeded by some start-up funds in response to requests for proposals. As a matter of engineering, fewer DEAS providers is better, since communication between DEAS in response to queries is an additional overhead, but this must be weighed against socio-technical, governance, and policy forces favoring a more distributed network of DEAS. In any case, all DEAS would need to be interoperable and intercommunicating in conformance to a single Federal standard, and would need to be audited for compliance with privacy and security policies. In response to a HITECH mandate, ONC has already begun a process for establishing governance of the NHIN. This process might also explore how best to operate DEAS. Because of its multiple advantages, we advocate a universal exchange mechanism for health IT that is based on tagged data elements in an extensible markup language. If there were another equally good solution, it should also be considered; we have collectively been unable to think of one. Tagged data elements can be combined for a single patient to produce the equivalent of an EHR, and organized around the needs of that patient at the time of care. At the same time, the data can be analyzed and combined with links to other information to provide physicians with clinical decision support, delivering patient-specific information to their fingertips to make the best possible decision for a patient given all of the information available. Tagged data elements from aggregated populations can also be combined to analyze comparative effectiveness of aspects of healthcare and improve efficiency and quality. Since the language of metadata-tagged data elements is extensible, not fixed, it can itself evolve in response to the development of new applications and new medical knowledge. As already mentioned, extensible exchange languages exist today and are already used within health IT in specialized niches—and are used widely in other sectors. A main finding of this report is that the time is ripe for such a language to be declared as a universal exchange language for health IT, and that doing so will catalyze a large number of immediate and longer term advances. Tagged data elements can be extracted by special software (known as middleware) from existing clinical systems. Or they can be produced from enhanced versions of those systems, or by completely new and innovative applications. In this way, all data could be exchanged among all systems no matter the origin or internal record formats of the data, and without the necessity of replacing existing legacy software. A universal data exchange language can scale up to any level. It can allow retrieval by patients and physicians of information from different providers, in different parts of the country, to improve safety and coordination. It can deal with the diversity and complexity of both the underlying business and clinical systems. New types of data and associated metadata can be added at any time, since new data elements do not have to fit into a particular format. Data can be converted to whatever form best supports their intended use, from clinical diagnosis to medical research. This approach can create a fully interoperable, less costly, more effective national health IT ecosystem. The availability of a universal exchange language can dramatically accelerate the entry of third-party innovators, because they can create applications that rely on uniformly described data elements and can access a larger market. These new applications could include cloud-based subscription services for individual doctors, small healthcare practices, long-term care facilities, large practices, and hospitals to handle practice management (e.g., registration, scheduling, and billing); sophisticated medical systems (e.g., decision support, integrated lab ordering, medication management, allergy tracking); integrated medical-image management; integration engines to facilitate data exchanges with personal health records and other types of EHR in the cloud; and population health management (e.g., analytical tools for public health reporting, clinical research, and outcomes analysis). The approach that we describe is consistent with existing market trends. Innovative companies are emerging that can access data from existing records and rearrange, store, and exchange the data as desired. Other companies are offering advanced software applications, information, and other services via the Internet. PHRs allow patients to store and monitor all of their health information and research their conditions using the full range of electronic resources. The approach described does not require the creation of a uniform patient identifier or a national repository for healthcare data. The data, protected by strong encryption, can be stored on existing legacy systems or in the rapidly evolving “cloud” of distributed data stores. Data involving a particular person can be stored in many different places and then aggregated, just as individual web pages are constructed from elements stored on many different computers. Specialized and secure search engines can crawl and index the metadata while actual access to the underlying data remains constrained by privacy protections. This system can provide much greater security and privacy protection than can the current system. The attached metadata would describe the use and access provisions of the data, in accordance with law, policy, or the patient’s privacy preferences where applicable. For example, in a circumstance where consumers give their consent for particular uses of their data and prohibit other uses, this information would be encoded in the metadata. For example, privacy restrictions embedded in the metadata could permit a physician to send a pharmacist the data required to fill a prescription and permit de-identified data to be used for clinical research, but restrict other uses of the data. Privacy considerations are discussed in greater detail in the following chapter. This chapter’s bottom line: A universal language for the exchange of health data is needed. An extensible markup language, where individual pieces of data can be tagged with context-setting metadata, is a straightforward solution and is superior to other proposed architectures. The President's Council of Advisors on Science and Technology (PCAST)on December 8, 2010 released a report entitled "Realizing the Full Potential of Health Information Technology to Improve Healthcare for Americans: The Path Forward." You can watch the video of the event here. One of the striking features of the report is that it calls for the creation of a "universal exchange language" to enable healthcare providers to share health information in real time, and a "digital infrastructure for locating patient records" while still providing for patient privacy and security. Keith Boone gives a great opening post into the standards this entails. It will improve healthcare quality, by making it possible for a physician to integrate accurately all of a patient’s medical information. It will improve healthcare quality and decrease costs, by making it possible for third-party innovators to compete to create widely applicable services and tools serving patients, providers, payers, public health officials, and researchers. It will provide much stronger privacy protection than available under current approaches, allowing persistent privacy assurances (including applicable patient preferences) to be attached to different kinds of information and using data-level encryption to prevent access of data by unauthorized persons. It will not require universal patient identifiers, nor will it require the creation of Federal databases of patients’ health information. It will simplify the regulatory burden on providers, by decreasing the focus of meaningful use regulations on ad hoc list of data items. It will help U.S. industry leapfrog to the front of the pack internationally in health IT, by providing exchange standards that can be more broadly adopted by others. It will facilitate public health and medical research, by providing a secure way to de-identify data. All of these points ring true. And the report further calls for more stringent data exchange requirements for future stages of meaningful use criteria. "The steps that must be taken can be accomplished with the required time frame. It can be accomplished via an evolutionary transition from traditional EHRs to a tagged data element model, along with a more rapid transition for the more limited purpose of data exchange by means of a universal exchange language," according to the report. "We note that these steps are not intended as an alternative to ONC's important work in promoting the adoption of electronic health records. Rather, they are complementary to that work and will accelerate adoption." I am in favor of the direction this report takes and will conduct deeper analysis over the coming weeks. There will still be a great deal of debate over how to best implement the recommendations in this report, but an important discussion has been given the spotlight, and I believe this will help drive the agenda forward. One thing is for certain - this report brings health information exchange to the forefront of the discussion on meaningful use of certified electronic health records. On December 6, 2010 the The Information Exchange Workgroup of the HIT Policy Committee met. Much of the discussion centered around upcoming recommendations to the HIT Policy Committee on entity-level provider directories (ELPD). The 2010 CAQH Administrative Simplification Conference was held September 21 - 22, 2010 in Washington, DC at the Omni Shoreham Hotel. The conference focused on two CAQH initiatives: the Universal Provider Datasource (UPD) and the Committee on Operating Rules for Information Exchange (CORE). Aneesh Chopra, Chief Technology Officer of the United States, gave the keynote address. I’m not so sure that taking a modular approach to achieving meaningful use is going to work with the latest guidance from ONC. It seems that they are taking a back door approach towards reinstating the all or nothing requirements that were scaled back from the proposed rule to the final rule. ONC posted on its website an FAQ stating that hospitals must have EHRs that have been certified against all 24 objectives of meaningful use, not just the 19 they plan to use to demonstrate meaningful use. This means that hospitals will need to purchase and implement technology beyond that required to comply with the meaningful use requirements, delaying many hospitals’ efforts to become meaningful users. Under the Medicare and Medicaid EHR Incentive Programs Final Rule, eligible health care providers are permitted to defer certain meaningful use objectives and measures and still receive an EHR incentive payment. However, it is our understanding that in order for us to have our EHR technology certified, we must implement all of the applicable capabilities specified in the adopted certification criteria regardless of whether we intend to use all of those capabilities to qualify for our EHR incentive payment. Is our understanding correct? Yes, this understanding is correct. The flexibility offered as part of the Medicare and Medicaid EHR Incentive Programs Final Rule is not mirrored in the Initial Set of Standards, Implementation Specifications, and Certification Criteria Final Rule because we believe that it is important to accommodate eligible health care providers’ ability to achieve meaningful use. We recognize that in some circumstances an eligible health care provider may not know which meaningful use measures they will seek to defer until they begin implementation and in others an individual provider (even within a specialty) will want to choose different measures to defer based on their local situation and implementation experience. Thus, in order to possess EHR technology that meets the definition of Certified EHR Technology, it must be tested and certified by an ONC-ATCB to all applicable certification criteria adopted by the Secretary. “A little under 9 months ago, we launched this project with the sketch of a dream: universal addressing and secure transport that would enable health information exchange reaching patients and providers where they are and where they are going in support of meaningful use and improved health outcomes. In that 9 months, we've agreed and disagreed, formed, stormed, normed and performed, and accomplished great things. We have two specifications that are content complete (needing editorial review and revision); two reference implementations that are at a 1.0 state and can "out of the box, just add trust" enable exchange with a simple install and configuration; some amazing documentation, from the elegant generalist overview, to the most geeked out installation and programming guides; a compelling presentation; solid best practices and security reviews to protect privacy, security and trust; and some incredible implementation geographies integrating directed exchange into physician workflow to enable meaningful use and improved quality. We are seeing multiple organizations, from commercial HIT organizations to public-private health information exchange organizations building Direct specifications into their products and building Direct implementations into their business plans and missions. This post was co-authored by Brian Ahier, Rich Elmore and David C. Kibbe. The Direct Project announced today the completion of its open-source connectivity-enabling software and the start of a series of pilots that will be demonstrating directed secure messaging for healthcare stakeholders over the Internet. The Direct Project specifies a simple, secure, scalable, standards-based way for participants to send encrypted health information directly to trusted recipients over the Internet. A new name: the Direct Project was previously known as NHIN Direct. An NHIN University course, "The Direct Project - Where We Are Today," to be presented by Arien Malec, Nov. 29 at 1 PM ET, sponsored by the National eHealth Collaborative. More than 20 health IT (HIT) vendors have announced plans to use the Direct Project for message transport in connection with their solutions and services. Presentations at the HIT Standards Committee on Tuesday, Nov. 30, where three or more vendors will be announcing their support for the Direct Project. A thorough documentation library, including a Direct Project Overview. Best practice guidance for directed messaging based on the policy work of the Privacy and Security Tiger team. A new website at DirectProject.org. A new hashtag, #directproject, for following the Direct Project on Twitter. The Direct Project is the collaborative and voluntary work of a group of healthcare stakeholders representing more than 50 provider, state, health information exchange (HIE) and HIT vendor organizations. More than 200 participants have contributed to the project. Its rapid progress, transparency, and community consensus approach have established it as a model of how to drive innovation at a national level. I have so much to be thankful for and this year and I am very grateful that so many of you have read and commented on this blog. I love to share information freely and really do appreciate you. I also especially want to urge anyone reading this to consider discussing end-of-life issues with their family this year at Thanksgiving time. This is really a perfect time to have these conversations and it is also an important family responsibility. In our family we have had to deal with some troubling decisions that could have been eased by thoughtful planning. At only 57 years old my mother was diagnosed with early-onset Alzheimer's disease (an uncommon form of dementia that strikes people younger than age 65). The disease progressed rapidly and she soon needed to be put in long term care. But the care didn't turn out to be be very long term - she could not feed herself and quickly lost the ability to swallow. Her mental condition swiftly degraded and we were faced with a very difficult and painful family decision. How extraordinary should be the measures we would take to keep the husk of our mother breathing, and when would we allow her to leave this earth? With modern technology she could have been kept alive for many years with zero quality of life. Our family wrestled with these and other decisions without much preparation. We eventually decided to provide only comfort measures and very soon my mother passed away at 64 years old. This was five years ago, and the pain still lingers, but I encourage you to have these difficult conversations as a family during this holiday season. Death is completely natural, and as a Christian I have great hope beyond this mortal life. We do not always get to choose the manner of our passing, so being prepared and letting your family know your wishes is an important way of showing your love. The rally is timed to coincide with a weekend when most of us are with the very people with whom we should be having these unbelievably important conversations – our closest friends and family. 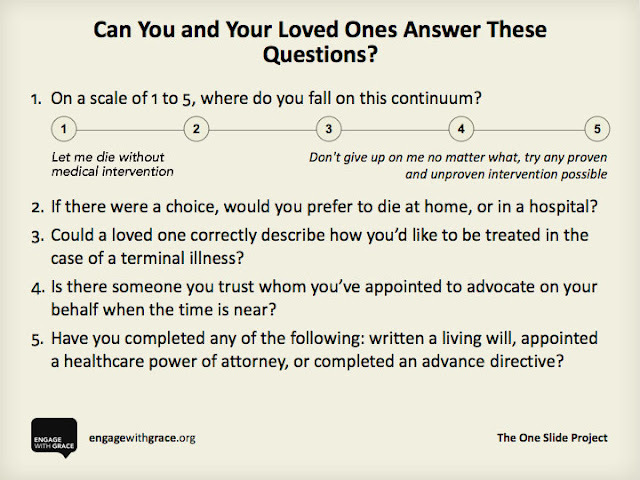 At the heart of Engage With Grace are five questions designed to get the conversation about end-of-life started. We’ve included them at the end of this post. They’re not easy questions, but they are important -- and believe it or not, most people find they actually enjoy discussing their answers with loved ones. The key is having the conversation before it’s too late. This past year has done so much to support our mission to get more and more people talking about their end-of-life wishes. We’ve heard stories with happy endings … and stories with endings that could’ve (and should’ve) been better. We’ve stared down political opposition. We’ve supported each other’s efforts. And we’ve helped make this a topic of national importance. To learn more please go to www.engagewithgrace.org. This post was written by Alexandra Drane and the Engage With Grace team. With U.S. healthcare expenditures projected to double by 2035, reforming payment and delivery systems is essential to reining in costs and achieving higher-value care. The Center for Medicare and Medicaid Innovation (CMI)—created by the new Patient Protection and Affordable Care Act—has the potential to accelerate, optimize and speed health care payment and delivery innovation. On October 18, the Engelberg Center for Health Care Reform at Brookings hosted a forum focused on key themes for accelerating health care innovation, including the importance of strategic public and private collaboration and alignment of investments to effect system-wide improvements in payment and delivery. Following keynote remarks by Donald Berwick, administrator of the Centers for Medicare and Medicaid Services, experts discussed methods to spur rapid identification, execution and evaluation of promising payment and delivery reform models, as well as issues surrounding CMI implementation. This paper (PDF) makes a great companion to the video below. The entire transcript is available here (pdf). The mHealth Summit was held November 8-10th at the Walter E. Washington Convention Center in Washington, D.C. The summit was organized by the Foundation for the National Institutes of Health, the mHealth Alliance and the National Institutes of Health. I was unable to attend, but followed the tweet stream and read some great blogs and watched videos from the event. I will tweet more videos as they are released. Below is a bnetTV interview of Todd Park, Chief Technology Officer for the US Department of Human and Health Services at the 2010 mHealth Summit held in Washington DC. And then Ted Turner founder and chairman of the UN Foundation and David Aylward Esecutive Director mHealth Alliance also spoke on the state of mobile health and its applications for the future. EHR Mobile applications that can be used on mobile devices such as the iPhone or Droid are in high demand by physicians, especially younger ones and tech savvy docs. At the NextGen User Group Meeting 2010 I had a chance to play with NextGen's latest mobile EHR. I have to admit I'm fairly impressed. With NextGen Mobile providers can make better medical decisions because they have quicker access to patient data, including labs, X-rays, and test results right on their mobile device. Nurses are even more enthusiastic about the solution, because providers no longer have to depend on them to access clinical information, and they have more time to spend with their patients. The feedback from clinical staff has been remarkable. And NextGen mobile also runs nicely on the iPad. There certainly needs to be an app developed that runs natively on both iOS and Droid, but so far NextGen has done a decent job of bringing something quickly to market running in the browser - and this is a vast improvement over what they had a year ago. 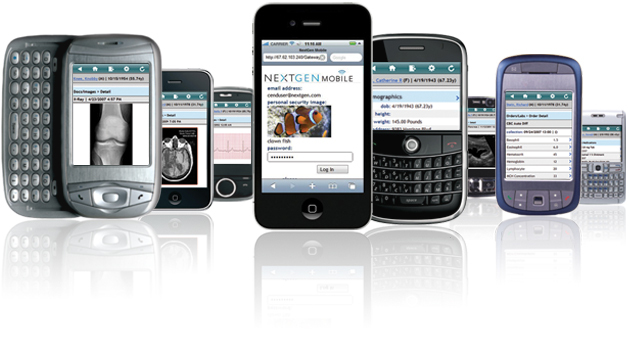 The new NextGen Mobile EHR seems really optimized for smartphone use. During the course of this presentation, we may make forward-looking statements within the meaning of the Private Securities Litigation Reform Act of 1995 including, but not limited to, certain forward looking statements that are based on the current beliefs of QSI Management as well assumptions made by and information currently available to QSI Management. Wherever practical QSI will identify these forward looking statements by using words such as may, will, expect, anticipate, project, believes, intends, estimates, could or similar expressions. We would like to caution you that such statements reflect only our current expectations and that actual events or results may differ materially. In addition, these forward looking statements are subject to a variety of risks and uncertainties which could cause QSI actual results, performance, prospects or opportunities in 2007 and beyond to differ materially from those expressed and/or implied by these statements. We refer you to the risk factors and cautionary language contained in our reports filed with the Securities and Exchange Commission from time to time, including, but not limited to, those risks and uncertainties listed in QSI's Annual Report on Form 10-K filed with the Securities and Exchange Commission and QSI's most recent Quarterly Report on Form 10-Q. Except as required by Federal Securities laws, QSI undertakes no obligation to publicly update or revise any forward looking statements whether as a result of new information, future events, changes circumstances or any other reason after the date of this presentation. I am at the NextGen User Group Meeting 2010 attending some workshops on meaningful use. I have been particularly impressed with Sarah Corley, MD who has a deep understanding of the requirements and what it will take for providers to achieve meaningful use and grab a hold of some of that sweet stimulus cash. Sarah serves as Chief Medical Officer of NextGen Healthcare, while continuing to practice part-time as a primary care internist in the Washington, DC area. NextGen is extremely fortunate to have this incredible resource. Additional presentations are being provided by Jessica Kasirsky, DO, a board certified physician in emergency medicine and a physician resource with NextGen. She also works as an emergency room physician at a community hospital in Westchester County, New York. Jessica also presented an excellent webinar earlier this year which is available from her blog posting here. NextGen has achieved complete EHR certification through CCHIT and you can view the certification criteria detail at the ONC CHPL (the Chapel). Later this week I will be looking at the continued development of cloud based offerings, which is where I believe the future of EHRs lies... The NextGen SaaS model could be particularly attractive to small practices and solo practioners looking to implement an EHR. The 2010 mid-term elections have given Republicans control of the House of Representatives while the Democrats have maintained control of the Senate. There were also some Republican gains in Governor's races around the country. These results will have some effects on healthcare in the United States. With Democrats remaining in charge in the Senate, there is likely to be little change in the dysfunctional nature of this body. If anything we may see more gridlock, as the Republicans have increased their filibuster opportunities. Senate committees will continue to be under Democratic control, so there may be some shuffling of the deck chairs, but there will likely not be much of a change in healthcare policy coming from the Senate for the next two years. Now that Republicans have control of the House of Representatives, there will be some changes in the roll out of health reforms. One immediate impact next year will be the change in leadership of the House committees and subcommittees, particularly those with oversight over healthcare. New chairpersons armed with subpoena power and the ability to influence policy on the health reform legislation is going to have a significant impact over the next two years. With Republicans winning at least nine new Governor's offices, giving them a clear majority, there could be additional challenges to health reform legislation. There are still some key races to be decided and the razor thin margins in traditionally Democratic controlled states could create new dynamics regardless of outcomes. Voters in Arizona and Oklahoma amended their state constitutions Tuesday with measures designed to block the new federal mandate on individuals and some employers to buy health insurance, while voters in Colorado defeated a similar initiative. Most states are operating under huge deficits, and unlike the federal government, they can't just print more money. There will be intense budgetary pressure on the states, which can have an impact of the ability to match federal funds. I think there is virtually no chance that the unspent stimulus funds designated for incentives for the adoption and meaningful use of electronic health records will be rescinded. However, the threat of possible reduction in funding to states, combined with their inability in many cases to match the future funding, will cause some states to possibly spend the funds too quickly without adequate planning. The House of Representatives will also be having radically different committee meetings and there is little doubt that there will be a sharp focus on CMS and the ONC and their activities. While it unlikely that the HITECH Act will be repealed or unfunded, the election results have made it much more difficult for the Obama administration to implement its broader healthcare agenda. Clarence Percy Ahier was from Jersey, born in 1892 and served as an artilleryman at the Somme and Ypres in the Great War. Many of those serving during the war recorded their memories, some became famous accounts, and others were locked away in cupboards and lofts. The war diary of one of my ancestors, Clarence Ahier falls, into the second category. This everyman's tale of an artilleryman serving in horrific conditions was donated to the Societe Jersiaise. It was discovered in a loft in Jersey and was handed to the Societe in a plastic carrier bag. The diary, telling his story from first enlisting in 1915 through to the return to his island home in 1919 is a typically understated British tale. A team of researchers at the Eindhoven University of Technology has developed a software tool that physicians can use to easily study the wiring of the brains of their patients. The tool converts MRI scans using special techniques to three-dimensional images. An image of 'brain wiring' made with the new tool. This now makes it possible to view a total picture of the winding roads and their contacts without having to operate. Doctors can virtually browse along the spaghetti-like "wiring" of the brain, with this new tool. Researcher Vesna Prčkovska defended her PhD thesis on this subject last week. To know accurately where the main nerve bundles in the brain are located is of immense importance for neurosurgeons, explains Bart ter Haar Romenij (professor of Biomedical Image Analysis, at the Department of Biomedical Engineering). As an example he cites ‘deep brain stimulation’, with which vibration seizures in patients with Parkinson’s disease can be suppressed. "With this new tool, you can determine exactly where to place the stimulation electrode in the brain. The guiding map has been improved: because we now see the roads on the map, we know better where to stick the needle." The technique may also yield many new insights into neurological and psychiatric disorders. And it is important for brain surgeons to know in advance where the critical nerve bundles are, to avoid damaging them. The accuracy of the tool is a great step forward. Especially intersections of nerve bundles were difficult to identify till now. Ter Haar Romenij: "You can now see for the first time the spaghetti-like structures and their connections." We are far from seeing all brain connections; there are many more smaller compounds in the brains, who are not seen by the new tool. A microscope observed them. "But you cannot, of course, dissect a live patient into slices for under a microscope," the professor smiles. The tool was developed by TU/e researcher Anna Vilanova, with her PhD students Vesna Prčkovska, Tim Peeters and Paulo Rodrigues. High angular resolution diffusion imaging (HARDI) is a diffusion weighted MRI technique that overcomes some of the decisive limitations of its predecessor diffusion tensor imaging (DTI) in the areas of composite nerve fiber structure. Despite the advantages, HARDI raises several issues: complex modeling of the data, non-intuitive and computationally demanding visualization, inability to interactively explore and transform the data etc. To overcome these drawbacks, we present a novel, multi-field visualization framework that adopts the benefits of both DTI and HARDI. By applying a classification scheme based on HARDI anisotropy measures, the most suitable model per imaging voxel is automatically chosen. This classification allows simplification of the data in areas with single fiber bundle coherence. To accomplish fast and interactive visualization for both HARDI and DTI modalities, we exploit the capabilities of modern GPUs for glyph rendering and adopt DTI fiber tracking in suitable regions. The resulting framework, allows user-friendly data exploration of fused HARDI and DTI data. Many incorporated features like sharpening, normalization, maxima enhancement and different types of color coding of the HARDI glyphs, simplify the data and enhance its features. The tool is based on a recently developed technology called HARDI (High Angular Resolution Diffusion Imaging). The MRI measuring technique for HARDI was already there, the research team took care of the processing, interpretation and interactive visualization of these very complex data, so that doctors can get to work. Bart ter Haar Romenij expects that the tool can be ready at relatively short notice for use in the hospital within a few years. "We need to validate the package. We now need to prove that the images match reality." Also, there is still work to do on the speed of the corresponding MRI scan. For a detailed view, a patient needs to be one hour in the scanner, which is too long. Moreover, the tool is already widely in use by other scientists, says the professor. The research was supported by NWO (Dutch Organization for Scientific Research). The thesis of Vesna Prčkovska is titled: High Angular Resolution Diffusion Imaging, Processing & Visualization. She graduated last Wednesday, October 20, 2010. Arien Malec gave an update on the From Direct Project (formerly NHIN Direct) to the October 27, 2010 HIT Standards Committee meeting. One thing Arien said that made me smile was, "I am going to stand by our decision to trust the community." The Direct Project has been such an incredible example of a collaborative process and I was happy to hear Doug Fridsma suggest that this process could be expanded to the development of the S&I Framework. The Direct Project develops specifications for a secure, scalable, standards-based way to establish universal health addressing and transport for participants (including providers, laboratories, hospitals, pharmacies and patients) to send encrypted health information directly to known, trusted recipients over the Internet. The Nationwide Health Information Network is a set of standards, services and policies that enable secure health information exchange over the Internet. The project itself will not run health information exchange services. Several Federal agencies and healthcare organizations are already using NHIN standards to exchange information amongst themselves and their partners. The Direct Project will expand the standards and service descriptions available to address the key Stage 1 requirements for Meaningful Use, and provide an easy "on-ramp" for a wide set of providers and organizations looking to adopt. At the conclusion of this project, there will be one nationwide exchange, consisting of the organizations that have come together in a common policy framework to implement the standards and services. This project is open government, and as such, contains avenues for a broad range of public participation. See below for more information on participation. At the beginning of this year Kevin Pho, MD, Tom Gehring, CEO of the San Diego Medical Society, and myself discussed the iPad and its potential impact on healthcare in a piece published by HealthLeaders Media. As Kevin said, "The iPad could serve as a simple digital electronic medical record system that communicates easily with pharmacies and other medical record systems." Well now ClearPractice has accomplished this feat with its new Nimble EHR, an innovative technology delivered via SaaS. Nimble is an EHR solution that connects either through Wi-Fi or 3G to the ClearPractice cloud so no data is stored on the device, making it secure and HIPAA compliant. The application contains all the features of the company's existing SaaS based EMR solution including scheduling, charting, prescribing, inpatient rounds, lab review/ordering, messaging and more. The product also seamlessly integrates with the company's practice management and billing system so all charges are automatically captured, scrubbed, and electronically submitted for payment. I spoke with Joel Andersen, the President of ClearPractice and discussed this new EHR designed specifically for the iPad. "We didn't just reproduce our existing EMR system on iPad, we actually designed the application for the iPad, taking advantage of the intuitive nature of the iOS platform." said Joel. "Regardless of whether they are at the hospital, the clinic or at home, the Nimble provides doctors instant access to the information and patient care tools they need. The point of care is now everywhere." "John Doerr, a venture capitalist and board member of ClearPractice, was the visionary for this product," said Joel. "He viewed the iPad as a transformational device for healthcare." Because of John, ClearPractice was able to have unprecedented access to Apple, and worked to design the software taking full advantage of the celebrated ease of use that Apple products provide. Nimble appears to be more intuitive than the traditional point and click EHR solution allowing for a more meaningful point of care usage. ClearPractice believes the only problem the HITECH Act immediately addressed was cost. And the meaningful use standards and certification criteria do not address usability. Many of the traditional EHRs can often slow physician workflow and actually impede adoption and meaningful use. With Nimble, they are looking to reshape and simplify the user experience for doctors. One of the goals of Nimble is to break down workflow burdens for doctors by providing them with technology that is lightweight, has a longer battery life and doesn't need to be rebooted as often. They are on track to have the software certified by Drummond for meaningful use before year's end. E-prescribing is an important element of meaningful use and has proven value to clinicians. The Nimble eRx solution presents context-specific integrated clinical decision support giving providers visibility into the cost, efficacy, and adverse effects of various medication-based therapeutic alternatives. And you can even send a prescription directly from your iPhone. 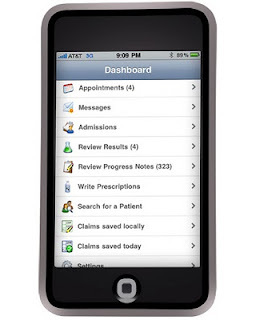 But you don't just get access to eRx, but a robust mobile EHR. Imagine having secure access to review patient charts, write new prescriptions or refill medications, view appointment schedules, and review and sign-off lab results on your iPhone. You can even send and receive messages with your clinical staff on the mobile app. Physician practices are not the only ones interested in Nimble. ClearPractice is also reaching out to hospitals who are looking to better serve their associated physicians through integrated acute and ambulatory EHR technology. And they are developing ways for health plans to inform and empower their physician network through data enriched EHR technology. They are working with their sister company, Lumeris, to develop robust interoperability between the Lumeris Maestro product and Nimble (I will be writing another post on the forthcoming announcement). Obviously, they are positioning themselves to enable technology solutions in Accountable Care Organizations and those working to move toward the medical home model of care. So far, the product seems to be a hit with physicians. Said Lianna Lawson, MD, of Lawson Family Medicine and Aesthetics in Daleville, Va., said: "I can actually give my patients better service because I am able to obtain information so quickly. Before, these tasks took much longer because I had to access this information from desktop. Now I carry my iPad around with me and I’m no longer keeping my patients waiting. There is no doubt, my patients expect quick response times and I am able to provide that because my productivity in the office is now extended outside the office. I can go anywhere and work at anytime. Honestly, I work more efficiently than I ever did and my patients love me a little bit more." The Patient Centered Primary Care Collaborative Centers for eHealth Adoption and Exchange and the Center for Multi-Stakeholder Demonstrations provided a webinar regarding two HITECH programs: The Regional Extension Center (REC) and Beacon Communities. Mat Kendall, Acting Director of the Office of Provider Adoption Support (OPAS) discussed the HITECH Regional Extension Center (REC) program and Craig Brammer, Deputy Director for the Beacon Community program with the Office of the National Coordinator for Health Information Technology discussed the Beacon Community Program. On Wednesday, September 22, 2010 at the Baker Institute Health Policy Forum at Rice University experts in health information technology (health IT) explored its potential for improving patient care and lowering health care costs. The seminar entitled "The Promise of Health Information Technology for the 21st Century" featured some of the leading thought leadership in health IT. This conference brought together some of the nation’s foremost experts in health IT from both the public and private sectors to explore the potential of health IT as a means of improving the quality of patient care and lowering overall health care costs. New developments in online healthcare have the potential to lead us into a new era of personalized healthcare. Some of these developments are direct-to-consumer personal genetic profiling and body imaging, and websites that provide health advice, storage of health records and medicines for sale. Scientists from the Nuffield Council on Bioethics called for increased surveillance of private firms that offer a range of genetic tests for conditions such as Alzheimer's, body scans to look for tumours or other issues, and those that sell medicines online. The Council established a Working Party in 2008 to examine the ethical issues raised by new developments and technologies that promise us more personalized healthcare. The group included members with expertise in medicine, science, law, philosophy, ethics, and health policy. The Working Party’s conclusions and recommendations are published in the report "Medical profiling and online medicine: the ethics of ‘personalised’ healthcare in a consumer age." This report weighs up the benefits and harms, along with the ethical values that come into play. Professor Christopher Hood FBA, is Chair of the Working Party. He is the Gladstone Professor of Government and Fellow, All Souls College, University of Oxford. Nikolas Rose was previously Professor of Sociology at Goldsmiths College and is now the James Martin White Professor of Sociology at the London School of Economics and Political Science. The Markle Foundation and the Robert Wood Johnson Foundation’s Pioneer Portfolio today recognized a set of innovations that convert simple health data downloads into useful tools to help U.S. veterans improve their health. The foundations sponsored the Blue Button Developer Challenge to stimulate innovation and encourage doctors, hospitals, pharmacies, insurers, and personal health information services to let their customers securely download their medical information at the click of a blue button. The U.S. Department of Veterans Affairs and Medicare have led the way by preparing to offer a blue button on their password-protected online portals to give veterans and beneficiaries the option of downloading copies of their medical or claims information. Adobe’s Blue Button Health Assistant received the top prize from a distinguished panel of judges: Craig Newmark, founder of craigslist.org; Steve Findlay, MPH, Senior Health Policy Analyst, Consumers Union; James Ralston, MD, MPH, Associate Investigator, Group Health Research Institute, and Steve Downs of RWJF. The foundations and the judges recognized the other finalists: Microsoft, MedCommons, and RememberItNow! For the challenge, Markle and Robert Wood Johnson Foundation asked participants to develop a web-based tool that uses test blue button downloads from the VA or Medicare to help patients stay healthy and manage their care. Findlay, of Consumers Union, emphasized not only the criteria for usefulness and usability but also the privacy requirements of the challenge. “Many consumers want convenient, secure access to their personal health information and connections to their providers, but only when their privacy and security is protected,” he said. Broad industry and consumer advocate support for the blue button emerged from a Markle Connecting for Health public-private collaboration. Fifty organizations from this collaboration—representing technology companies, insurers, provider groups, and consumer and privacy advocates—recently supported a set of privacy practices for the blue button. The privacy practices are part of the Markle Common Framework for Networked Personal Health Information, which recommends policy and technology safeguards to encourage individual access to information and privacy. Adobe demonstrated an application and a security-enabled PDF document for patients to store their downloads and share them with providers. MedCommons demonstrated how veterans could create online packets of radiology images when they go for second opinions. Microsoft showed how its online HealthVault platform could consume the VA data and allow it to be used in a variety of third-party applications that a patient might choose. RememberItNow focused on medication reminders for veterans.